The 2nd annual charity game will take place on 1st of June on the Jubilee Parks with a 3pm kick off. County fans won the trophy last year in Glasgow and aim to retain the title against a caley side who are wanting revenge. Where about is it and what is the minimum age for taking part? Has he got a final baaaalllll??? Shalk's there!!!! DAMN....was going to offer to take photos at this (playing nowadays is definately not my strong point for I be the same shape as Bobby Mann), but I'm on holiday. Disclaimer -Anything posted by this user is likely to contain large amount of sarcasm, humour and nuts. At no time should anything be taken seriously, even on serious topics. Failure to do so may result in confusion and your tongue turning black, consult a doctor if symptoms persist. As long as I'm not offshore you'll see another striking master class by myself. Is it next to the stadium? 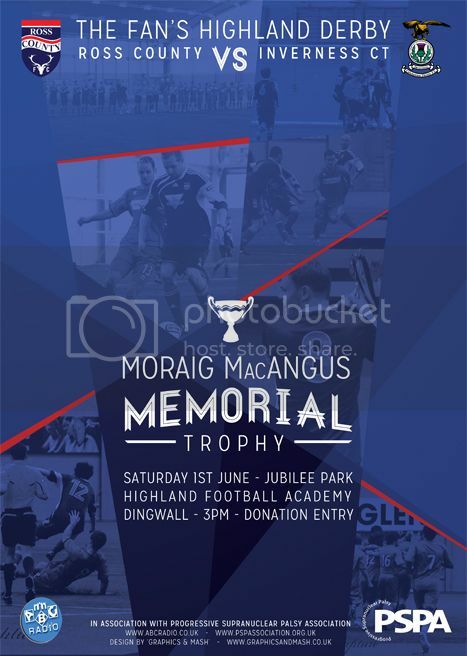 (03-20-2013, 11:46 PM)stirlingshire_staggie Wrote: The 2nd annual charity game will take place on 1st of June on the Jubilee Parks with a 3pm kick off. How do ya get involved to play? I'd be really interested in playing too if you were looking for bodies. It's the pitch behind the away stand. Was going to be in the stadium but due to the state of the pitch it won't happen. Next best thing really. As for playing I have already sorted a squad of central staggies and a few folk from up north. I could probably put posters up in Tain. I can play if you want except I'm 11. Is that ok? (03-22-2013, 08:29 AM)Gordie the staggie Wrote: I could probably put posters up in Tain. I can play if you want except I'm 11. Is that ok? You are bit young pal. The caley team are hardy lads. We heard they were all Lewis Girls. Here is the official blurb. After the success of last year’s charity game between Ross County and Inverness CT in Glasgow, The charity game returns for another year and heads home to the Highlands. With both highland rivals managing to reach the top 6 in this year’s Scottish Premier League and It being the Staggie’s first ever season in the top flight, it has been nothing short than Phenomenal. This give both sides a chance to celebrate that Highland football is alive and well in the top flight of Scottish Football. Last year’s result went in favour of County winning 5-4 on penalties. The game will be held at the Jubilee Park behind the Global Energy Stadium on Saturday the 1st of June with a 3pm Kick Off. Spectators would be asked to donate £3 to watch the game. All proceeds will go to the Progressive Supranuclear Palsy Association. BUZZING - Can not wait. With it being played in Dingwall, here's hoping of a good size crowd. I will certainly be spreading the word. Im still looking for folk from tain, alness, inver g and inverness to put up some poster. Aye they seem up for it. Our lads are working on fitness and remember how to play football. How does one get involved? I have hoored myself out to Caley as well. We've got a squad for the game and I believe caley are sorted too.